All are welcome to attend the lighting of the Diocese of Brooklyn’s Christmas Tree at the Soldiers and Sailors Memorial Arch in Grand Army Plaza on Monday, Dec. 11 at 4 p.m. Bishop Nicholas DiMarzio will be there to bless the largest Christmas tree ever erected in Prospect Park at over 35 feet tall. Here’s a rare treat: Lessons and Carols in five languages! That’s something you’ll only find in Brooklyn, specifically at Our Lady of the Presentation – Our Lady of Mercy parish, Brownsville, on Sunday Dec. 17 at 4 p.m. Hymns will be sung in English, French, Igbo, Spanish and Garifuna at this event the whole family can enjoy. Call 718-345-2604 for more information. Our Lady of the Miraculous Medal parish, Ridgewood, will celebrate its 100th anniversary on Sunday, Dec. 10 at the 10:30 a.m. Mass. Bishop Nicholas DiMarzio will be the main celebrant of the Mass. A reception will follow in the parish hall. Looking for the perfect gift for that special someone who seems to have everything? Get tickets to a Christmas Concert and Reception, featuring Irish Tenor Ronan Tynan, Dec. 22 at St. Francis de Sales parish, Belle Harbor. Tickets to the concert are $75 each, but if you want to really splurge, you can see the concert and attend a special reception for $125. Reception includes open bar, hors d’oeuvres, dessert and Irish coffee. Call 718-634-6464. Archbishop Molloy H.S., Briarwood, is hosting a Basketball Alumni Reunion on Jan. 12, 2018. The event is open to all alumni who played basketball at Molloy on any level. There will be a 6 p.m. reception with food and beverages, and VIP seating as the current boys varsity team takes on St. Francis Prep, Fresh Meadows, that evening. To attend, contact Matt Rizzotti at 718-943-3186. 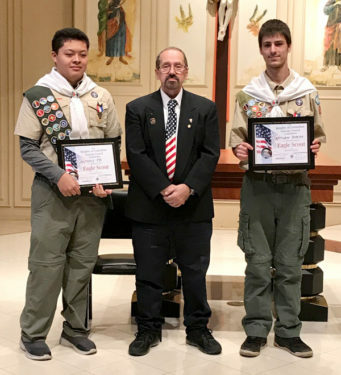 Congratulations to the most recent recipients of the Eagle Scout Award at St. Anastasia parish, Douglaston: Anthony Ho, at left, and Matthew Pereira, right. They are pictured with Frederick Bedell Jr., grand knight of St. Anastasia’s Knights of Columbus Council No. 5911, who presented them with their awards.